It is amazing how colour can transform a room! 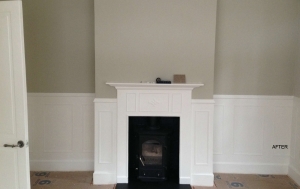 Here we took a tired study/snug and removed the old shelving; painted the walls in Zoffany Double-Paris grey, the paneling and the fire surround was painted in Zoffany Quarter-linen. 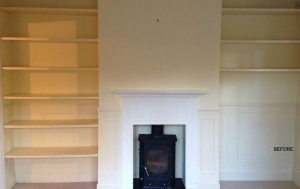 We painted inside of the fireplace behind the wood-burner in Farrow & Ball Railings, which is a blue/black. The transformation was completed in a day.